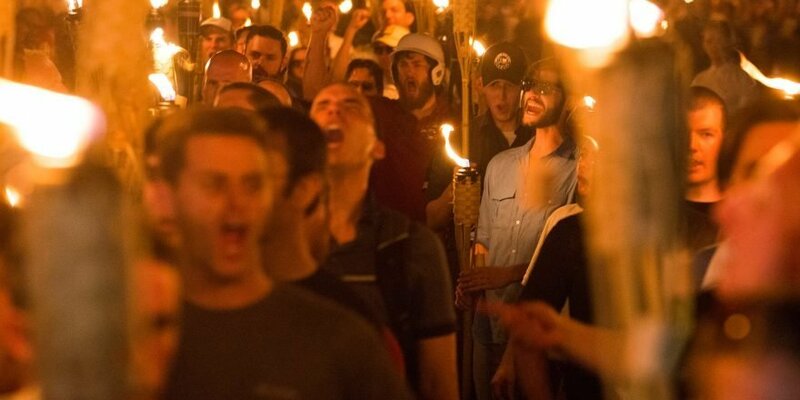 After facing scathing criticism over their lame response to last year’s deadly white nationalist riot, Charlottesville, Virginia, authorities say they’re ready for anything on Sunday’s one-year anniversary of the mayhem — even though no organized protests have been scheduled. Charlottesville officials have vowed a massive police presence — with some 1,000 personnel assigned — to deter any violence. The “Unite the Right” rally last August, called to protest the removal of a Confederate statue, turned the picturesque Virginia college town into a war zone, with out-of-control street brawls and the death of a woman who was mowed down by an Ohio white supremacist who allegedly rammed his car into a crowd of counter-protesters. The organizer of last year’s event, white nationalist Jason Kessler, was denied a permit in Charlottesville this year but got the OK from the National Park Service to hold a demonstration Sunday in Lafayette Park in Washington, across the street from the White House. DC officials said Thursday that police were ready for the rally as well as five planned counter-protests that could attract more than 2,000 people in all. Metropolitan Police Chief Peter Newsham said cops were determined to keep the two sides apart and that guns would be banned from the demonstration area. Larry Hogan, the Republican governor of Maryland, said Friday that “hate has no place in our society” and that he had directed state agencies to work with their counterparts in Washington and Virginia to ensure the safety of all citizens. Amid continuing controversy over President Trump’s views on race, the events will likely revive memories of his comments after Charlottesville when he said both sides were to blame for the violence, and that there were “many fine people” among the torch-bearing white nationalists. The remarks sparked outrage from across the political spectrum as the president refused to condemn the white nationalists. In Charlottesville, officials have announced an unprecedented lockdown of the bustling downtown district. Vehicles are prohibited, and pedestrians will be allowed in at only two checkpoints, where police will confiscate contraband, including metal pipes, swords, fireworks and skateboards. After last year’s violence, the city asked the state legislature to ban firearms from major public events, but the bill failed to advance in a state with some of the least restrictive gun laws on the books. It was not clear whether any white nationalists would venture to Charlottesville this weekend, but officials said they were preparing for any contingency. Police were widely criticized after last year’s event, when some officers did not intervene to stop fistfights, beatings and other violence. Charlottesville’s chief of police at the time, Al S. Thomas Jr., resigned in December, two weeks after a critical report about the department’s failure to quell violence between white supremacists and counter-protesters, a group that included violent anti-fascists. The report said that as violence broke out, cops lingered behind barricades and did little if anything to stop the violence unfolding right before their eyes. The city’s plan to maintain order was “much like it is on Saturday afternoon for a football game,” despite warnings that violence would break out, according to the report, which was supervised by a former federal prosecutor. Virginia’s Democratic governor, Ralph Northam, declared a state of emergency Wednesday, which freed up additional resources. Many business owners have said the plan is too restrictive and will cost them significant revenue on what would normally be a busy summer weekend. Merchants already suffered a downturn after last year’s event, with sales tax revenue dropping 11 percent in September 2017 compared with the year before, according to city figures.